WRAPUP: Incredible weather, great roads, great food and a whole bunch of MINI (and Mini) people. This was the perfect start to the driving season!! We wound up with a really nice sunny warm day for a drive.. Over 40 cars participated in a fun cruise on some quiet backroads. We had a nice mix of new people and familiar faces. The drive ended with a lunch with the Minis In Northern Illinois club. A round of raffle prizes finished a great MINI day. Huge thanks to Paul who did all the route planning, organizing, and lead drive duty and the M.I.N.I club for letting us share their afternoon with us. Plans are in the works for our April and May events. Full details won’t be posted for a little while, but mark your calendars now so you can attend. 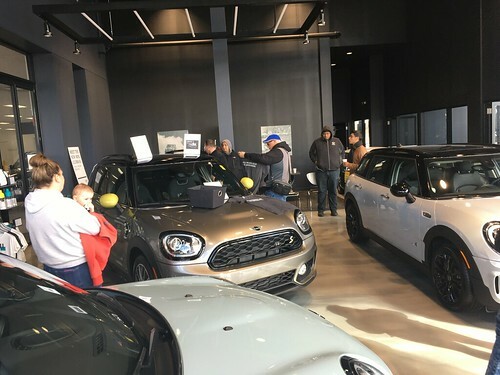 The Windy City BMW club has invited the Chicago MINI Motoring Club to participate in their indoor kart racing event on Saturday March 14 at 9:45am. The location is at the newer Addison facility of ChicagoIndoorRacing. The format is 15 teams of 4 randomly selected, with a 30 minute qualifying session followed by a 1 hour race. Click here for the application form and additional details. Huge thanks to Jim for co-organizing the event as well as inviting our club!! Knauz MINI will be displaying the new R57 MINI Convertible on February 16th, 17th and 18th. Ryan Smith from the Tribune RedEye is looking for a person to interview about small cars. Check out the message below, and if you are interested and fit the criteria, drop him a line (and be sure to put in a good word about the Chicago MINI Motoring Club)..